Those of you who have the most stage fright or fear of public speaking have the potential to be the most impactful speakers or performers, because you have the feelings! Your feelings are up to the surface where you can use them to create a genuine emotional connection with the audience. You cannot think away your feelings, deny them or cover them up. I am sure you have tried as I did and it just did not work. So your task is to transform your intense feelings into the energy of passion that will help you give your gift to others. To transform your stage fright into authentic presence, you must become genuine when you speak to others. To help yourself become authentic, learn to do four things. First, accept yourself as a sensitive person with strong feelings and make your feelings OK. Second, learn to include your emotional self when you are communicating or presenting so that others get your passion. Third, learn to stay grounded when you present to others. Fourth, open to receive the love and support of others, letting go of the expectation that they are going to judge you. Because you are sensitive, you must develop a style of presentation or performance that is based on being who you really are, not who you think you should be. Your degree of comfort is directly related to your willingness to be real. Only when you are authentic will you feel comfortable and confident. It may help some to understand what causes stage fright, what happens in stage fright and what its opposite, presence, is. So, let me explain what I have discovered about stage fright and fear of public speaking. Stage fright is fear of feeling in front of others. It is simply strong emotional energy you do not know how to express when you become the center of attention or have to speak or perform in some way. Stage fright is always triggered by the belief that you should be perfect and that somehow you are not good enough just as you are. You expect that you are going to be judged as lacking or less than others. If you have a lot of stage fright, it is because you did not learn it was acceptable to be the sensitive person you are. It may even be that you were actually criticized and diminished for your thoughts, feelings and your very being. As a result you experience being the center of attention as uncomfortable and shameful rather than exciting and pleasurable. You cannot contain the strong sensations within your body because they seem too intense and out of control. You believe that if you show your true feelings that you will be unacceptable to others. So, when you become the center of attention, there is only one thing to do - try to leave. If you can't get out of the situation by avoiding the event, then you have to try to avoid the sensations felt inside. That means, you have to try to "leave" your physical body by abandoning awareness of your body. This abandonment of the physical self happens instantly and unconsciously. The way you leave your body is to "go up into your head" in an attempt to avoid the emotions. Your awareness rises up into your head so your head is flooded with energy and you cannot think clearly. It feels like your head swells or you are in a fog. From the neck down, you tighten the body in order to freeze the flow of feeling. Suddenly, you are no longer present. You no longer have awareness of being in your body. Your awareness is somewhere else. Your mind is trying to help you feel safe but it actually leaves you feeling disoriented and more vulnerable. Your body loses strength and stability. Since you are not relaxed into your body, it begins to shake and tremble in an attempt to get energy flowing and bring you back inside your body. I am sure you can describe many more symptoms of stage fright and fear of public speaking, including sweaty palms, fat tongue, neck and face flushing, heart pounding, loss of breath and high, squeaky voice. Of course, there is no way to do a great presentation, performance or to communicate effectively in this state. Traditional presentation training would have you believe that if you learn the mechanics of public speaking all will be well. That simply does not work for people with strong stage fright. It does not work to overlay mechanical speaking skills on top of such fear. You can learn the mechanics of presentation but that does not deal with the underlying emotional intensity. To transform your stage fright, you need to let yourself have the experience of feeling your feelings in front of others. I believe you need a safe group of people in an unconditionally supportive atmosphere to do this process of transforming stage fright. Because stage fright is fear of feeling in front of others, you need other people to witness your process of opening to be authentic. If you are willing to go into your fear, into the sensations of tension in your body that are so uncomfortable and share them with others who have similar feelings, you will find the experience is not as bad as you expected. In fact, as you allow yourself permission to feel your tensions and share them, you will be amazed at how quickly they release out of your body. Giving yourself permission to feel releases the emotional intensity in a way that is almost magical. When you do not resist the sensations, they literally dissolve away. As the tension dissolves, you start to relax deeply into your own body. Receiving acceptance for being who you are in front of others, you relax into your authentic self. You begin to shine with an inner sense of confidence and are energized from within to share your passion. It actually feels good to be the center of attention. You discover a new, safe ground inside your own body - a quiet place of power and presence. At this point in your process, you begin to develop the palpable presence that makes you magnetic. Presence is the opposite of stage fright. Instead of being up in your head, you are relaxed fully into your body or grounded as I call it. When you are present and grounded, you experience an inner flow state of being all here now, focused in this moment. Grounding is the most effective antidote to stage fright and fear of public speaking that I know. It produces a remarkable sense of safety, strength and clarity of mind. To ground yourself, learn to shift attention and energy from your head and redistribute it throughout your entire body all the way down to your feet. You can think on your feet when you are in your feet. To assist people in learning to ground, I have recorded a grounding meditation on an audiocassette tape, which you can purchase, from my web site at www.self-expression.com. Repeated over time, grounding creates a full-bodied sense of awareness. It helps you stay in your body and connect to your authentic feelings in intense situations such as giving a presentation. It is the inner connection to full feeling or passion that is so magnetic. People are drawn to passion. Passion is star quality energy. As you develop more of this star quality energy, your presence becomes so strong that others sense it. You touch people on an unspoken level with the power to influence and hold attention of others. Star quality or authentic presence is the ability to allow others to see who you are. A star is willing to be seen and to receive attention of others. In receiving others fully, you are giving back love and support to them. If all this sounds impossible for you let me assure you that it is not. You can transform your stage fright into authentic presence. In the mid 1980's, I began to experiment with my own stage fright and with my acting and speaking students. Following my intuition, I discovered a group process that helps people go through their stage fright and develop a presence that radiates with the passion of their spirit. In my Zimmer Method process called Speaking from the Heart, I have found that the people in my classes who have the most stage fright are always the ones who touch us the deepest. As they learn to be authentic with their depth of feeling and learn to use that feeling to their benefit, they connect so powerfully with others that they captivate us with their passion. I hope the awareness I have shared here is of value to you. This article has only been able to share a small amount of information about stage fright and fear of public speaking and how to heal it. The real magic is in the doing of it - in the allowing yourself to go through the process. 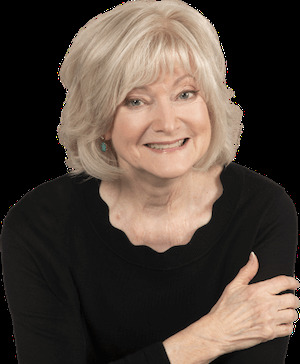 If you are interested in finding out more about The Zimmer Method and The Speaking from the Heart, please visit my web site at www.self-expression.com. 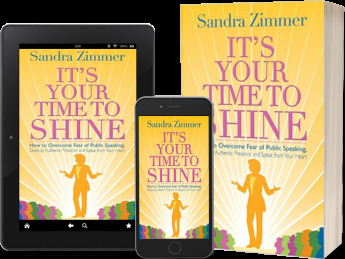 Sandra Zimmer is the President and Founder of the Self-Expression Center in Houston, Texas. She works with professionals who are struggling with communication, who are gripped with fear about speaking to groups,or who don't like the sound of their voice. She guides people through experiential learning programs that connect them with their natural abilities to express, communicate and present so they feel confident to share their ideas, insights and expertise with the world. Sandra can be reached at 281-293-7070.